A Canadian man found another use for his bong after using it to fend off four thieves who were attempting to rob a cannabis dispensary. 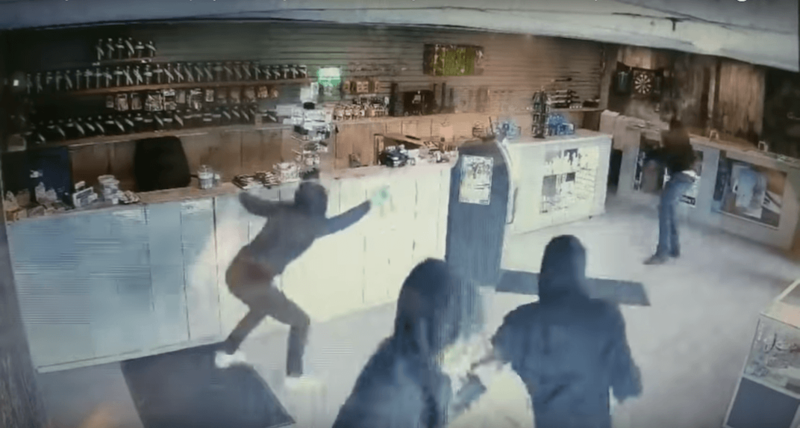 According to security footage shared online, on Thursday, September 6, around 4 pm, four masked individuals entered the Recreational Cannabis Farmers Market situated on Old Highway 2 in Shannonville, just over two hours east of Toronto. The masked individuals, who entered the store while brandishing canisters of bear spray, were met with great resistance by the store clerk. The store clerk managed to successfully fight the suspects off with a bong and force them out of the store. According to the video description, the suspects then fled the scene westbound on Old Highway 2 in a white SUV. OPP Forensic Identification Unit came in to provide assistance and collected evidence from the scene. The incident is still under investigation and if anybody has any information about this Robbery, please contact Cst. Brinklow or D/Cst. Leland of the Tyendinaga Police Service at 613-967-3888.